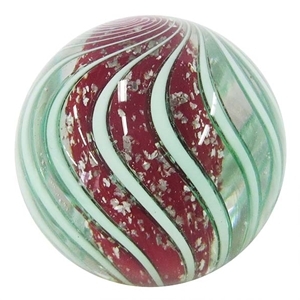 MoonMarble.com - Fritz Lauenstein - "Mint Green Canes over a Red and Mica Core Marble"
Art Glass → Contemporary Handmade Marbles → Fritz Lauenstein - "Mint Green Canes over a Red and Mica Core Marble"
This is a handmade marble by Fritz Lauenstein. It has a red core and encased in flecks of silver mica. Over the core the surface has 12 canes of mint green glass that spiral around the core and twist back in the opposite direction. Marble measures 1 1/2" in diameter. Signed and dated.